There were three interesting acquisitions in the last week or so: Apache aquired Sequence, Synfora acquired Esterel Studio and Global Foundries acquired Chartered. The Apache/Sequence acquisition is interesting for a couple of reasons. One is that both companies are private and I think we will see much more of this. A lot of the smaller EDA companies simply will not make it and the big guys don’t have a lot of appetite for acquisition these days. And let’s face it, this is not a success story for Sequence. Sequence itself has a long history, extending back to its two ancestor companies, Sente and Frequency Technology. A third company, Sapphire, got folded in a little later. Sente goes all the way back to the early 1990s and Frequency to the mid-90s. The company was completely recapitalized at least once, but that didn’t seem to be enough to get them to lift-off. Clearly the investors didn’t have an appetite to do it again and pulled the plug. Sequence managed to carve out a good niche with its PowerTheater product which has become one of the standard tools for power measurement. But Sequence never managed to truly make the transition to focus on that one successful product, I think since its older products were in use at key customers and they couldn’t afford the loss of revenue from stopping development on them. Maybe inside Apache that will be easier to rationalize. Synfora acquiring Esterel Studio is, of course, another private company making an acquisition, although this time of technology rather than a company. Esterel was actually developed in Sophia Antipolis at Ecole des Mines (yes, the school of mining although it really is much more general engineering these days) to where a couple of years later I’d relocate. 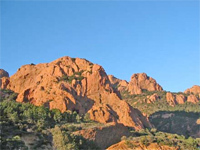 The Esterel is the large red rocky peninsula between Cannes and San Tropez. But I digress. Since Synfora apparently has several customer already using both products together, since they are largely complementary, I should think integration should be straightforward. The other acquisition was Global Foundries and Chartered Semiconductor. Technically it is the government of Abu Dhabi that owns them both, but clearly the intention is to attempt to create a more integrated foundry business. I never really understood why Chartered wasn’t more successful than it was. One theory I’ve heard is that they were very slow to make critical decisions since every decision had to go back to Singapore and so they failed to get close to their customers (who, pretty much by definition, were not in Singapore since it’s tiny). Both companies are members of IBM’s foundry club although their focus is different. Global Foundries has a lot riding on the success of AMD (whence it was spun-out) and I’m afraid I’m skeptical about that. Chartered is in the mainline bulk-CMOS business and struggles against TSMC since wafer costs are largely a matter of scale. TSMC has incrementally been building a gigafab with 100,000 wafer starts per month, which conventional wisdom considers gives it at leas a 10% cost advantage over merely large fabs. That’s a big difference. I think we are going to see more consolidation in both EDA and semiconductor. In EDA, I think the strong private companies will swallow the weak. But there aren’t that many strong swallowers so we’ll also see companies just fade away. In semiconductor I think that there may be some consolidation at the level of companies merging, but more likely are whole divisions being sold to create stronger focused companies, as happened with NXP selling their wireless business to ST, and Freescale selling their wireless business to…well, nobody wanted it. This entry was posted in eda industry, management. Bookmark the permalink.